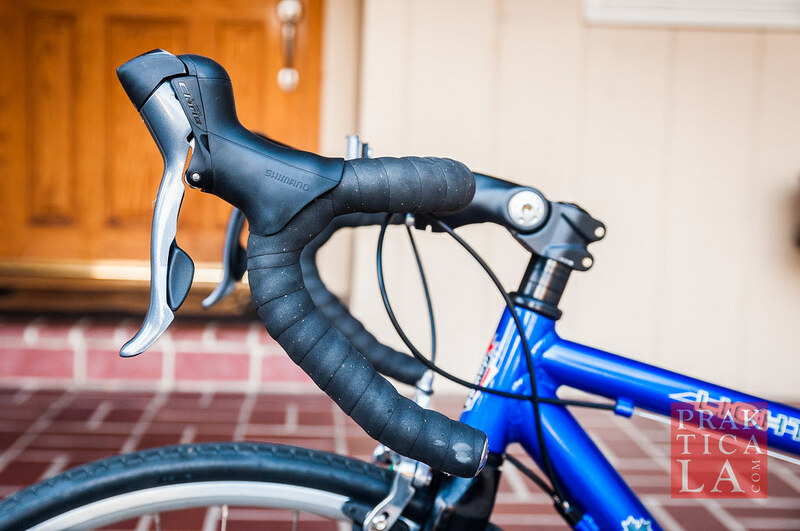 Dawes Lightning DLX Review – Entry Level Road Bike! I recently obtained an even more affordable bike, the Dawes Lightning DLX. 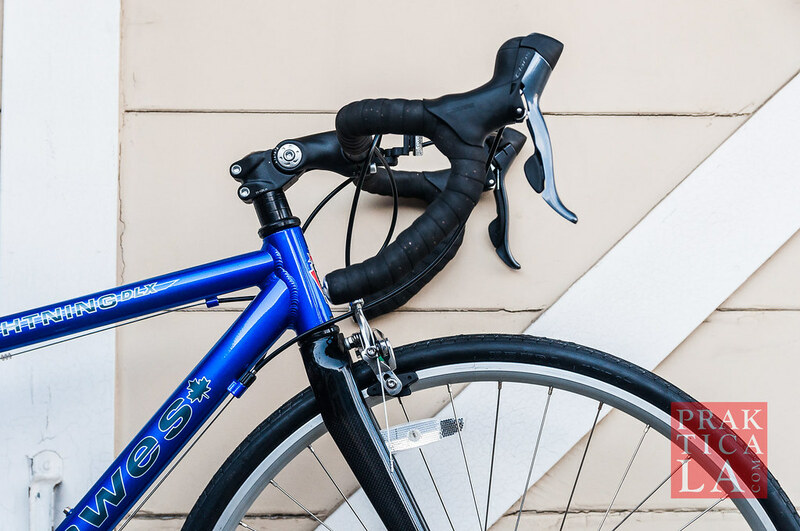 While not flashy by any means, this solid road bike provides excellent bang for buck as either a casual ride or an entry into the world of road biking. Read the full Dawes Lightning DLX review below! Pretty much anything you get at Bikes Direct will be miles ahead of any bike from Target, Walmart, etc. This Dawes Lightning DLX was acquired from Bike Island, Bikes Direct’s closeout site, who retails blemished and/or old inventory. (The product page always notes the exact condition.) While Bike Island’s selection is more limited, the prices there are even lower than on Bikes Direct! It is worthwhile to note that I could not detect ANY blemishes or faults on the Dawes Lightning DLX that I received! The Dawes Lightning DLX stands out (or rather, doesn’t) due to its “Plain Jane” appearance. The blue paint job and decal work more than suffice, but they don’t grab attention. This may actually be a good thing if you don’t want unscrupulous thieves jacking your bike. As long as you can get over the rather pedestrian appearance, the bike is actually really solid and well-built, with way-above-average components for its price. 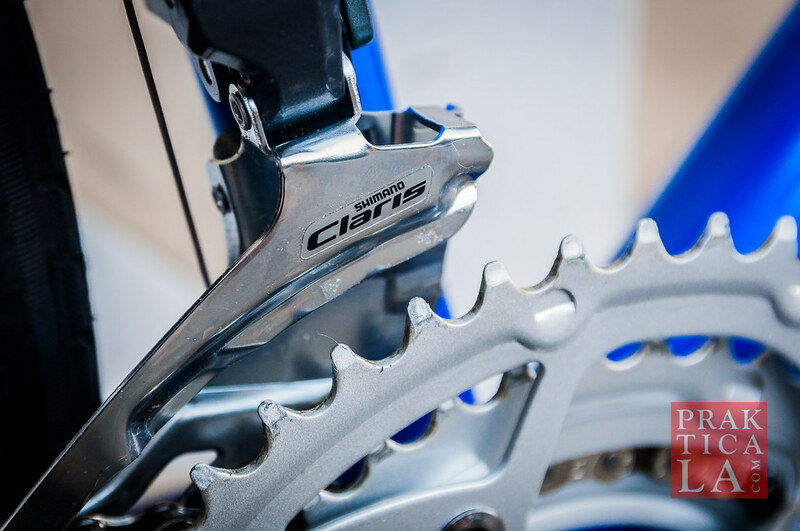 The product specs list the bike as having some random “Microshift” front derailleur and brakes/shifters, but – surprise – they arrived as Shimano Claris, which is even better! This puts the primary groupset components on the same level as the Poseidon bike, but at an even lower list price. Not only that, the rear derailleur is an upgraded 8-speed Sora! 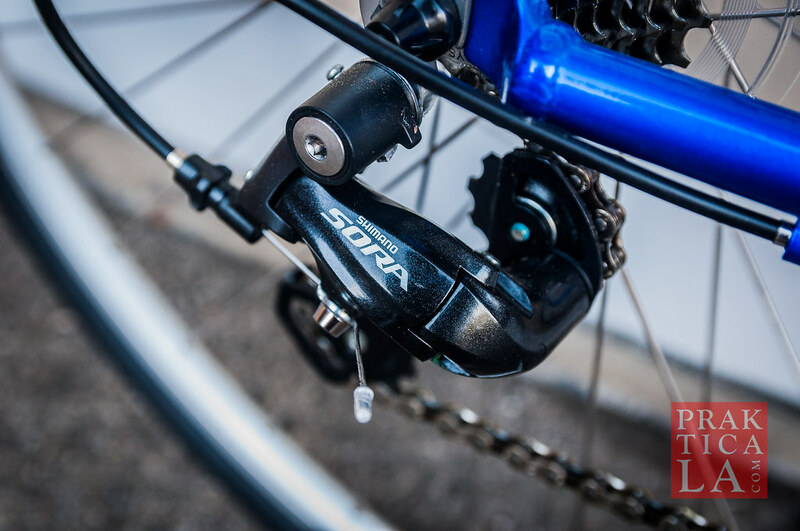 Shimano Sora rear derailleur. What??? 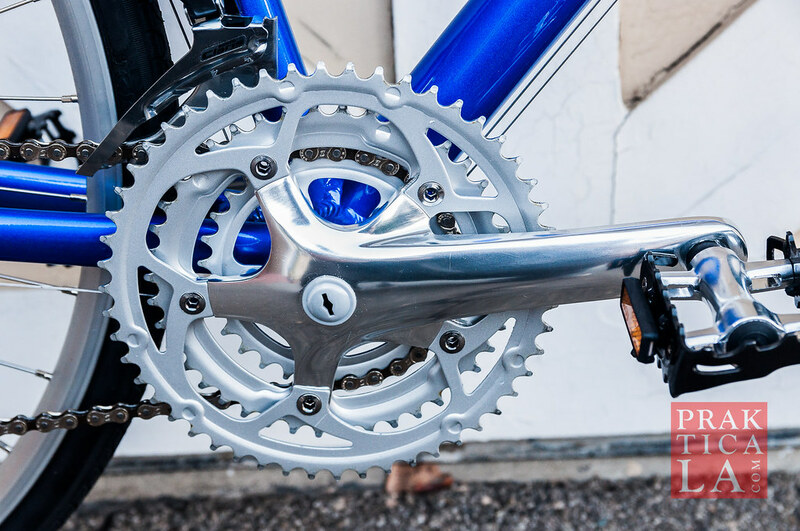 The cranks are attached to a triple chainring – not my favorite (I prefer a simpler compact), but it does provide you a wider range of gearing for climbs, for a total of 24 gears. Beginning riders may find three rings somewhat complicated, but after some practice, shifting should become second nature. Also nifty: the stem is adjustable, so you can fiddle with the height to best fit your riding position. 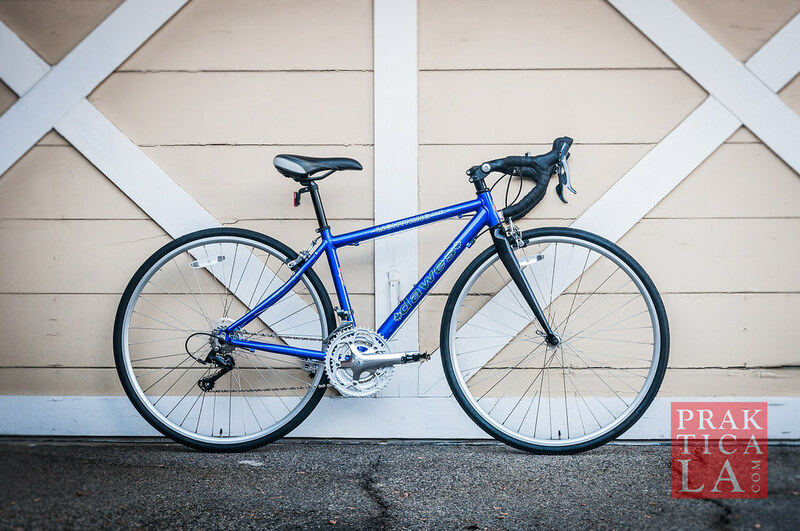 The rest of the components are pretty standard for an entry-level road bike. 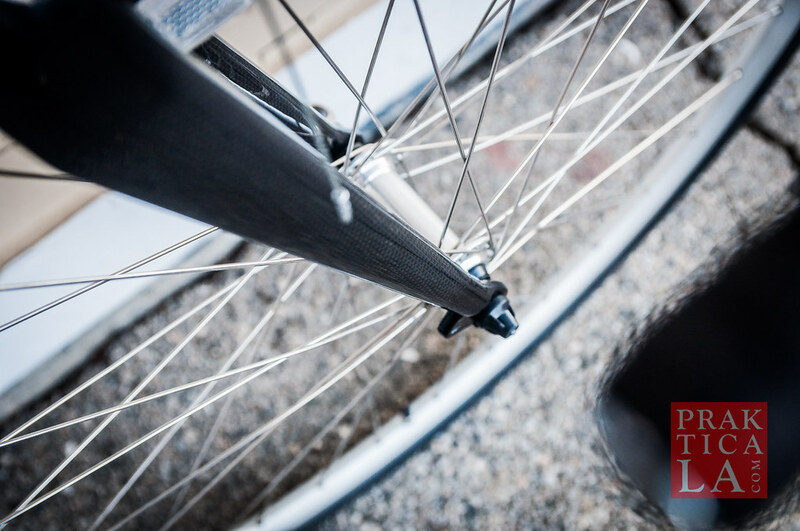 The seat, wheels, tires (700x25c), quick-release skewers, and so on are totally serviceable. 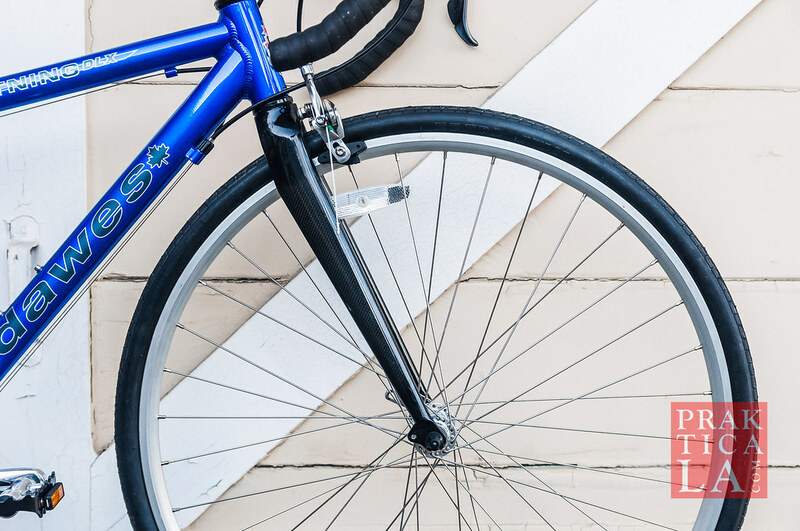 I took the Dawes Lightning DLX for a spin and was honestly surprised by how comfortable and smooth the ride was. 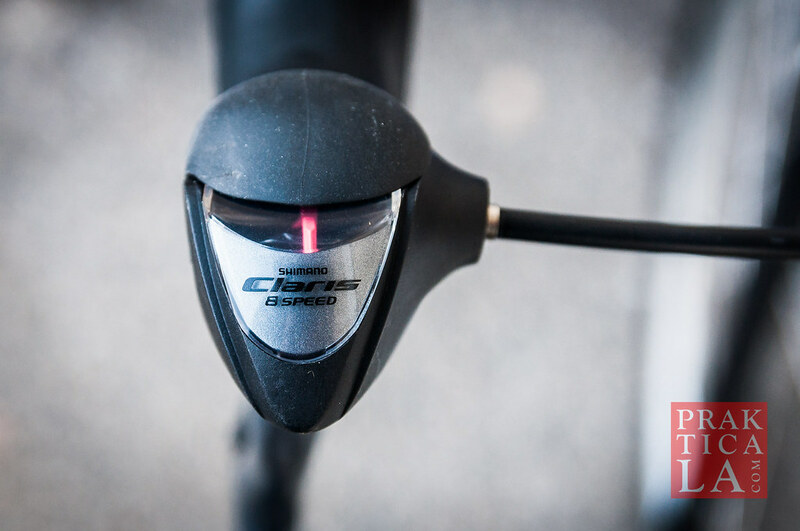 Shifting gears is a snap using the Claris STI shifters, which integrate the gear shifters with the brake levers – typically an expensive component. Note the gear indicator. Mostly a novelty feature, you will almost certainly ignore this after you get accustomed to the gears. Braking was adequate. As with on most entry-level bikes, I would eventually ditch the stock rubber brake pads and replace them with metal-backed pads, like these pads from Kool Stop. They are inexpensive, long-lasting, and improve stopping power considerably. Made in China. So what? PROS: Totally solid bike. Smooth riding and shifting. Components punch way above weight class. FREAKIN’ CHEAP. CONS: Generic, utilitarian appearance, aka minimal cool factor. Requires some minor assembly (YouTube how-to videos abound). Would personally prefer a compact chainring over the triple (although this makes climbing easier for novices). This is the minimum level of road bike I recommend for purchase. Anything lower, and you will most likely want to upgrade if you continue riding. 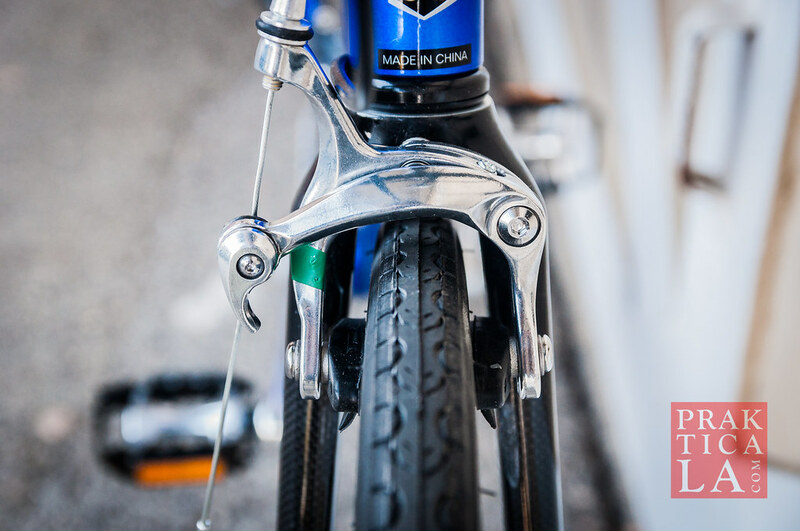 Normally, this threshold hovers between the $500-$1,000 price range (see the Poseidon bike). The Dawes Lightning DLX is even cheaper than that. And it’s EVEN CHEAPER if you can snag it (or its equivalent) from Bike Island. For casual riding, this bike has everything you need. For more intensive biking with steeper climbs that require more power, better components and/or lighter frames provide incremental (but certainly not critical) advantages. Bottom line: If you’re starting out as a road biker and aren’t the type who needs to show off your hardware, this is probably the best deal you’re going to find anywhere. 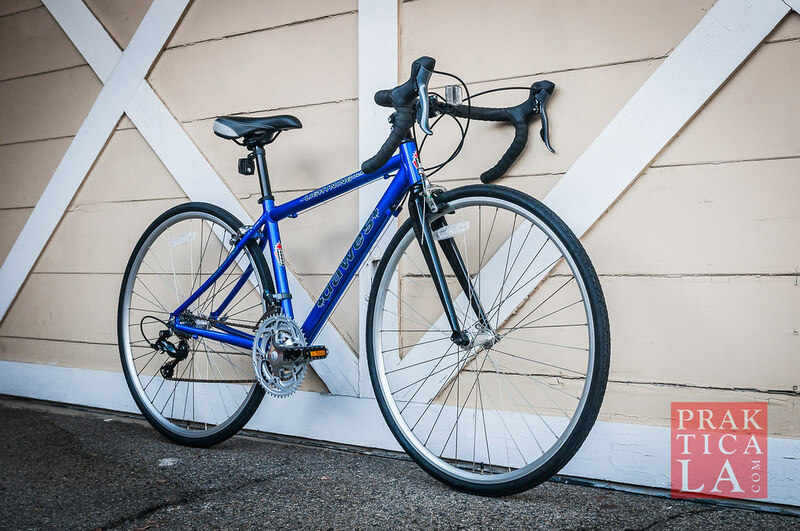 Check out the Dawes Lightning DLX inventory at Bikes Direct here. Don’t forget to check Bikes Island frequently for any closeouts too! 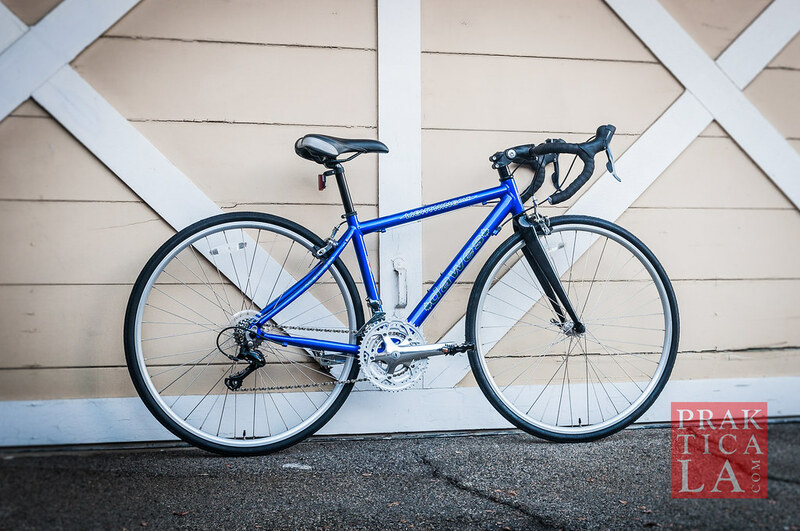 Have you ridden the Dawes Lightning DLX or something similar? 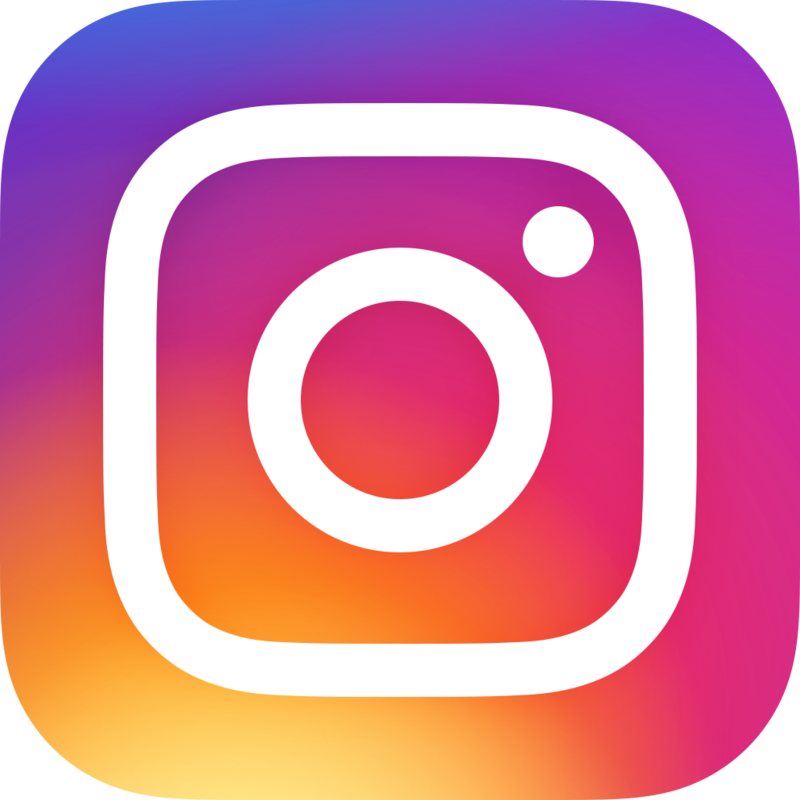 Share your experience in the comments below! Lightning sport the lowest rung on the Dawes ladder component wise is tourney hardware but the wheels are the same as the dlx runs good but low gear is 28-39 making step hills a shore. Other than that I’m happy with my purchase which was used with no miles for 120. I’m looking now at the dlx for the gearing advantage but don’t know if is worth it. I do all my climbing in 28-39 or higher (on the Motobecane Le Champion CF) – some people have suggested I get some easier chainrings, but so far I’ve been able to push through! Thanks for the comment, Robert!